We recently completed an exciting study looking at how the Zone Diet, using primarily Zone PastaRx compared to a traditional American Diet on markers of blood sugar control and body composition. The results from the 6-week study are quite remarkable. To appreciate how remarkable the findings are requires a little background on how Zone PastaRx came to be and why this isn’t just regular pasta. Pasta has traditionally been a staple in many diets due its versatility, variety of offerings, low cost, and minimal time to prepare. It’s a no brainer that Italians are the largest consumers of pasta per person, but since 2011, Italy’s consumption of pasta is down 10.8%, along with U.S. consumption being down 3.6% since 2015 (1). The average American will have consumed 6 pounds of pasta by the end of 2017, but concern about expanding waistlines, high concentration of carbohydrates, inclusion of gluten, and impact on blood sugar, has put pasta to the back-burner for many. The Zone stance on grains and refined carbohydrates such as traditional pasta, breads, and rice, if consumed, is to keep them to condiment sized portions and to balance them with an equal volume of protein. This helps to minimize spikes in blood sugar and lessen the impact that food has in creating inflammation within our bodies. When choosing carbs we suggest they primarily come from vegetables and small amounts of fruits and legumes. This gives you the most bang for your buck in regards to the concentrations of polyphenols, fiber, vitamins, and minerals. What if there was a food that had the versatility and ease of use like traditional pasta, without the hormonal side effects of hunger, fatigue, and weight gain? Welcome PastaRx. PastaRx is the next evolution of the Zone Diet, developed to make it easier for people to get to the Zone and stay there using pasta as the main protein (yes protein, not carbohydrate) source in a meal. The goal was to create food products with a functional response that would help stabilize blood sugar and ultimately control hunger. 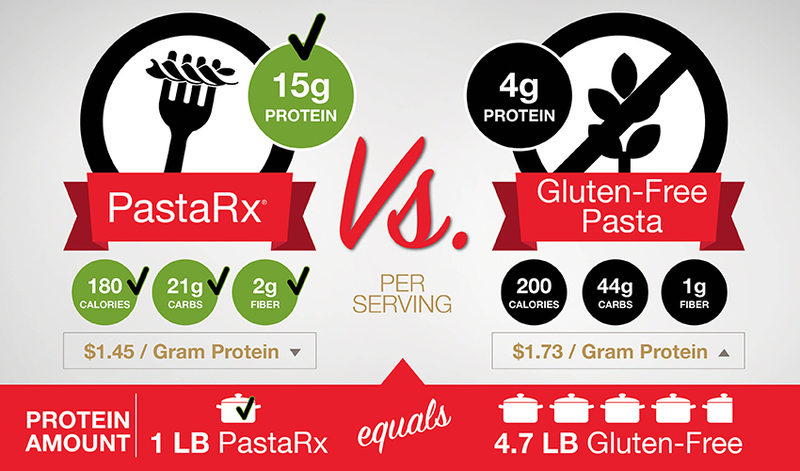 Where traditional pasta is high in carbohydrates and low in protein, PastaRx has a low carbohydrate to protein ratio and has been clinically shown to help with markers of blood sugar control, by helping to reduce insulin resistance. It brings convenience back to meal time, allowing something that previously may have been avoided or used in small portions back to being a staple in the diet. Background: All carbohydrates are broken down into simple sugars, like glucose, that can be absorbed by the gut. The faster glucose enters our bloodstream the more the hormone insulin is secreted to distribute that glucose for absorption into our muscle, fat and liver cells for later use. When these cells don’t respond properly to insulin, the pancreas continues to secrete greater amounts of insulin in an effort to get glucose into the cells. This is called insulin resistance. This is the underlying cause of hunger and eventually fat accumulation and acceleration of chronic disease. Design of Clinical Trial for PastaRx: The primary way to significantly lower insulin resistance is calorie restriction. We set out to investigate how a calorie restricted diet, using Zone Foods (e.g. 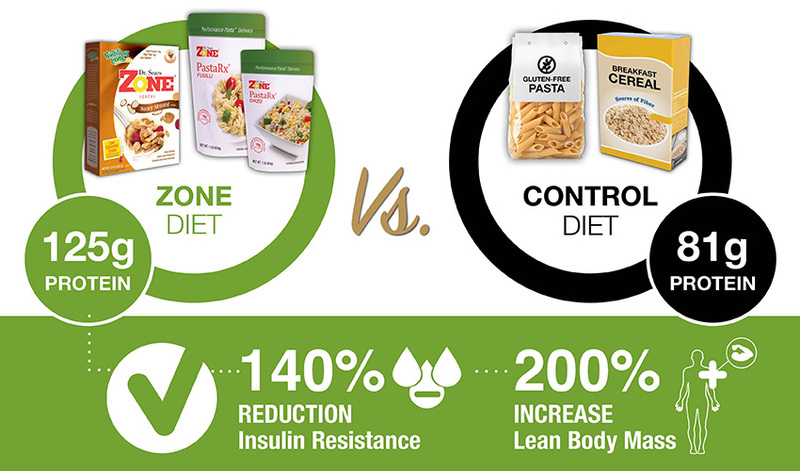 Zone Cereal and PastaRx Orzo and Fusilli) as the primary source of protein would compare to a similar calorie-restricted, control diet using commercial cereal and gluten-free pasta. Individuals were randomly assigned to one of these two groups for 6 weeks and were unable to tell the difference between PastaRx and gluten-free pasta. Findings: The combination of modest calorie restriction (300-500 calories per day compared to their usual intake) using PastaRx-based Zone Foods as a primary source of protein spread evenly over the course of a day, was 140% more effective in reducing insulin resistance compared to a similar calorie restricted control diet using gluten-free pasta. In addition, individuals following the PastaRx-based Zone Diet had a significant increase in Lean Body Mass. Gluten is a name for the proteins found in wheat products that gives them their shape and form. For individuals with true Celiac Disease, gluten needs to be avoided as it can promote an inflammatory response within the body. About 1 in 100 people worldwide have Celiac Disease. Zone PastaRx does contain gluten, however, the science is strong that for those who may be “gluten sensitive”, their problem may not be gluten, but FODMAPs found in pasta. FODMAPs (fermentable oligo, di, mono-carbohydrates and polyols) are poorly absorbed carbohydrates found in wheat products that can generate gastric distress upon reaching the colon. Studies have shown that “gluten-sensitive” individuals put on a low-FODMAP diet demonstrate no gastric distress when challenged with high levels of gluten. Zone PastaRx is a low-FODMAP food with unique hormonal responses to help stop hunger and fatigue. 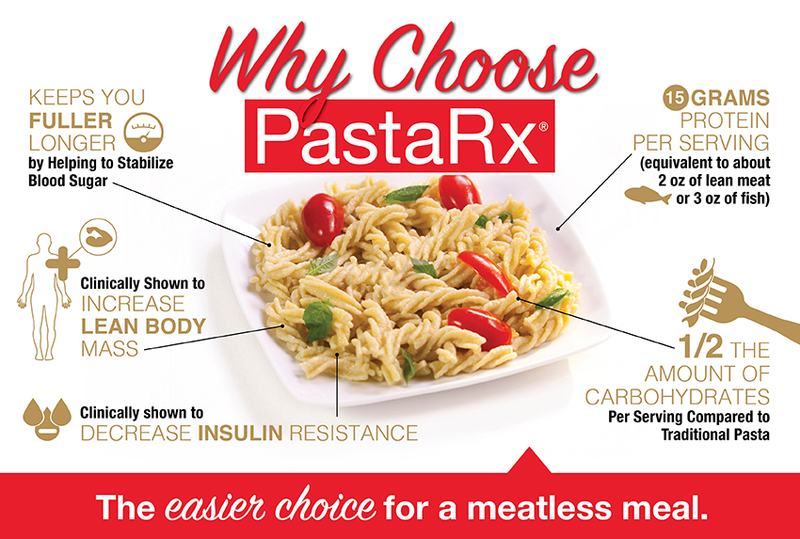 With all the pasta options out there we know it can get a bit confusing, but hopefully, this has cleared the air and shown you why PastaRx isn’t your regular pasta and why you can now enjoy pasta without the guilt! Don’t take our word for it, see for yourself with PastaRx! Want some inspiration, check out our recipe section. So if you have true Celiac Sprue Disease then unfortunately we are unable to eat this pasta, so another question then. My Doctor wants me on this diet, so what do I do now since I am unable to eat this food? And is there any gluten in the fish oil pills or the maquirx pills? What is this protein made of? source? So there are 8 servings to a one pound bad of pasta RX thus each meal is about $2?